In precious metals futures on Thursday, palladium stood alone with gains while gold, silver and platinum declined for a second straight session. 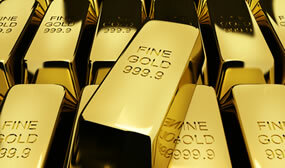 Gold ended at a new, five-week low. Gold for June delivery shed $4.90, or 0.4%, to settle at $1,317.90 an ounce on the Comex division of the New York Mercantile Exchange. The close is the weakest since March 20. "What gold is looking for is a new consolidation range after the quick move back to the downside in the absence of safe-haven buying we saw earlier in April," MarketWatch quoted Jeff Wright, executive vice president at Gold Mining Inc.
Gold futures ranged from a low of $1,316.20 to a high of $1,328. They lost 0.8% on Wednesday, advanced 0.7% on Tuesday, and dropped 1.1% in starting the trading week on Monday. July platinum fell $2.60, or 0.3%, to $910.10 an ounce, ranging from $907.80 to $919.40. Palladium for June delivery added $11.55, or 1.2%, to $979.05 an ounce, trading between $960.45 and $987.60. United States Mint bullion sales climbed for the first time this week with a modest 25,000 increase in American Silver Eagles.